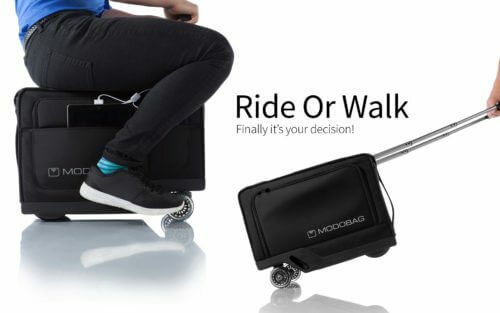 Modobag: Why Walk When You Can Ride? Modobag is changing the way the world travels with a state-of-the-art, high-performance, motorized, carry-on luggage compliant suitcase. Home > Client News > Modobag: Why Walk When You Can Ride? RPL client Modobag LLC (http://modobag.com) is changing the way the world travels. Led by Kevin O’Donnell and Boyd Bruner, Modobag is running an overwhelmingly successful crowdfunding campaign on IndieGoGo for the world’s first motorized ridable luggage (https://www.indiegogo.com/projects/modobag-world-s-first-motorized-rideable-luggage-travel-technology/). There are only 13 days left for you to get in on the early bird specials being offered and be in line for an estimated January 2017 delivery. Modobag is a state-of-the-art, high-performance, motorized, carry-on luggage compliant suitcase—an incredibly fun and practical solution for everything from air travel to daily commuting. After initially conceiving the Modobag, Kevin brought on his friend Boyd to help with the technical design. Boyd knows a thing or two about innovative transportation, having won multiple AMA National victories as Crew Chief and Lead Technician and having built the motorcycle that won the 2014 Daytona 200. Having had a front row seat to the evolution of the product (including countless laps around the 84th Floor of the Willis Tower), the RPL team is excited to see the Modobag ready to hit the market. It’s safe to say, no product that has come through our law firm has been more fun than the Modobag. First watch this video to learn more about the Modobag, then head to IndieGoGo and order one for yourself! *Don’t miss the footage of Patrick Richards riding an early prototype version of the Modobag to the Willis Tower at 2:29.